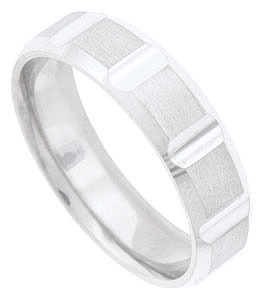 The rough textured surface of this 14K white gold mens wedding band is angle carved to reveal a bright polished core. The surface is sliced through at regular intervals giving the band a linked appearance. The edges of the wedding ring are sharply angled and polished smooth. The modern ring measures 5.85 mm in width. Size 10 1/4. We cannot re-size, but we can reorder in other sizes. Also available in 18K, yellow gold, platinum and palladium. Contact us for current market cost.